The inaugural Veterinary Employability Forum was held at Peppers Salt Resort & Spa, Kingscliff on the Tweed Coast of New South Wales, Australia, from 8-9 February 2017. 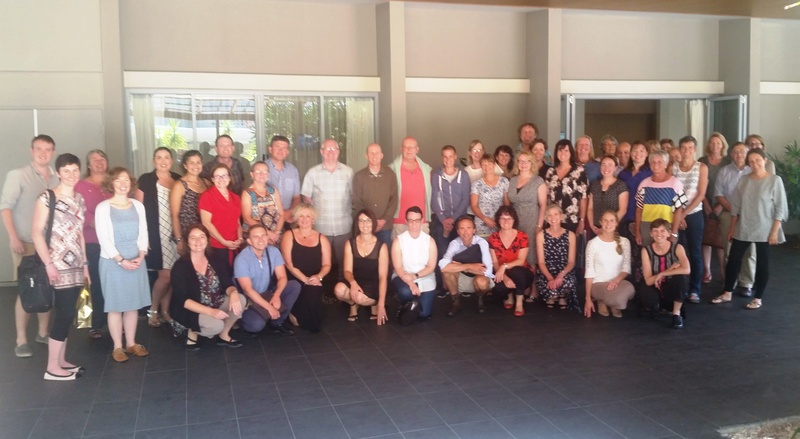 In the beautiful subtropical surrounds of Kingscliff, 48 delegates from a range of veterinary backgrounds came together for this Forum, to discuss for the first time how the emerging issue of employability might apply in the veterinary context. As wryly noted by Forum convener, A/Prof. Martin Cake, perhaps not such a difficult ‘world-first’ to achieve, since this word has scarcely been mentioned in the veterinary world – but nonetheless an issue of immediate relevance, given background concerns for sustainable employment, wellbeing, and future-proofing the profession. It was agreed that employability offers a holistic approach to focusing undergraduate learning outcomes closer to the needs of all the relevant stakeholders, namely the employer or enterprise, clients, colleagues, and not least the graduate veterinarian themselves, enabling success and satisfaction in their career for the benefit of all. Employability was defined at the Forum as “a set of personal and professional capabilities that enable a veterinarian to gain employment, and develop a professional pathway that achieves satisfaction and success”, though it was noted that it is as much a career-long process as it is an accumulated skill set. The Forum posed the key questions of, what are the key elements of employability in the veterinary context, and how can these be developed in students and early-career veterinarians? A series of short presentations and lively intervening discussions tackled these questions from the perspectives of the relevant stakeholders, including fresh evidence from dedicated qualitative and quantitative research supported by the VetSet2Go project. The ‘real-world’ perspectives of experienced practitioners, employers, and professional bodies (AVA) were also invaluable in providing a balanced view from theory and practice. Q: Who is (or rather, who should be) responsible for ensuring graduates are ‘work ready’? Q: How can we usefully define employability without narrowing the scope of employment? Q: How can we measure/assess employability? Please click here for the Veterinary Employability Forum Program. The presented evidence and rich discussions of this Forum will inform development of a Veterinary Employability Framework and White Paper by the VetSet2Go project later in 2017. Interviews with employers of veterinary graduates showed that while they look for a range of personal attributes, interpersonal skills, and veterinary capabilities, these are not ‘one size fits all’ and interface with the need for ‘job match’ (Dan Schull, U Qld and others). Paired interviews with graduates and their employers showed success in practice is founded particularly in self-confidence, communication, teamwork, resilience, and keenness to learn (Melinda Bell, Murdoch U). Focus group and survey data from UK and Australian clients shows they particularly value veterinarians who display commitment to animal welfare and high quality care; are compassionate, open and honest; can provide clear explanations; and inspires confidence in their skills and knowledge (i.e. a balance of professionalism and humanity) (Susan Rhind, Edinburgh U and others). Client complaints lodged with the NZ Veterinary Council showed that while complaints are typically presented as issues of perceived competence or quality of care, they often reveal an underlying basis in professional skills such as communication or honesty (Stuart Gordon, Massey U). A working example of how an ‘in-house’ graduate development program (Greencross Ltd.) can yield a win-win outcome of benefit to the early career vet, the mentors, and the enterprise. The broader employment landscape is set to change radically in the near future, with ~40% of current Australian jobs at risk of disappearing within 10-15 years (zombie jobs), and addressing this threat through employability is becoming a key priority for universities (keynote speaker Jessica Vanderlelie, Griffith U). A large international survey of stakeholders found consensus around the importance of communication skills (both with clients and colleagues), teamwork, working behavior (work ethic, honesty, integrity), technical competence, and psychological capital such as motivation, resilience, and personal efficacy (Melinda Bell, Murdoch U). Efforts to develop resilient and ‘career-ready’ teachers can provide useful interdisciplinary lessons for veterinary educators (keynote speaker Caroline Mansfield, Murdoch U). The factors contributing to resilience in early-career vets are less well studied than those contributing to mental ill-health, but some factors identified so far include self-compassion, mindfulness, and social support (Michelle McArthur, U Adelaide and Susan Matthew, Washington State U). Embedded Practitioner-in-Residence programs can provide authentic opportunities for employability development (Leonie Richards, U Melbourne). Assessment of employability may require more faith in more qualitative, less reliable tools such as professional portfolios, which (contrary to student perceptions) tend to predict career preparedness better than more formal quantitative evaluations (keynote speaker Kate Cobb, U Nottingham).